How Often Do You Clean Your Bed Sheets? As a kid, did you fear the things under your bed? Well, as an adult, you should worry what’s inside—especially if the bed goes unwashed. This entry was posted in Blog on February 6, 2018 by admin. What Does Your Laundry Say About You? For many of us, laundry is seen as a necessary evil. In order to have clean clothes to wear and to remove stains and allergens from clothing, laundry is essential. Despite its importance, many of us take vastly different approaches to the activity. So, what do your laundry habits say about what kind of individual you are? This tends to be the most common category and many of us may fall under this. Life can be so busy and we often have so many responsibilities, with work, schooling, family commitments and trying to have a social life, finding time for laundry can be a struggle. Individuals in this category care about their appearance and want to look clean and tidy, so multitasking is an important skill to develop. If you belong to this group, you don’t feel any sense of urgency when it comes to laundry. If you’re a laundry procrastinator, you’ll likely find any excuse to put off the chore or to get someone else to do it for you. Don’t overstuff the washer or dryer. This will cause your clothes to come out more wrinkled and less clean. Place clothes in color-coded baskets as soon as you take them off. This prevents you from having to sort them come laundry time. If you’re in this category, you view dirty clothes a bit differently than the rest of us. A pile of dirty clothes doesn’t bother you in the least and you’re totally comfortable wearing the same clothes numerous days in a row. Regardless of what approach you take to your laundry, here at WashDay Laundry Centre we can make your laundry an easy and convenient process! Not only do we offer over 60 coin laundry machines but our friendly staff also provide dry cleaning, full wash and fold services and much more! Come check out Durham Region’s premier laundry facility to see how we can best meet your needs! This entry was posted in Blog on January 9, 2018 by admin. Is today laundry day in your home? Even after all the clothes have been washed and dried, the laundry process is not yet complete! There’s still the task of properly folding and hanging all those clothes to properly hold their shape until they’re worn. Use the following tips to ensure all your clean clothes are correctly stored away for a fresh, crumple-free look! When left to sit in the dryer, clothes will begin to wrinkle. To keep your clothes smooth and wrinkle-free, it’s best to remove them as soon as their cycle in the dyer is complete. The fabric clothing is made from impacts its folding ability. Slippery items that don’t hold their fold well are best hung. This prevents clothing from becoming wrinkled. Silk, polyester and nylon are examples of fabrics that don’t fold well and are best hung. Fabrics such as knits and sturdy sweaters can be folded without concern for creases. For all the tall people out there, you can ignore this part; however, for the rest of us, although the top shelf can seem like great storage space for clothes opt for a lower shelf. Many of us have probably experienced the situation of stacking clothes on a high shelf, only to knock the whole pile over when reaching for one of the items. Opting for a more convenient shelf or drawer can prevent you from having to refold clothes you keep knocking over. Last but certainly not least are socks. Balling up your socks stretches out their elastics. The best folding method for your socks is to put them together and fold them in half. Laundry is a chore that probably very few enjoy. Fortunately, there are ways to streamline the process and minimize how much of your day is devoted to this activity. Utilize these tips on your next trip to come out with clean clothes and more time left in the day! Separating colours and whites, before leaving your house, cuts out one more step to do once you’re at the laundromat. Instead of having to divide your clothes as you’re putting them into the machines, you can just put your already divided piles into their respective machines, saving tons of time! Planning your trips to the laundromat based-off what times tend to be least busy, is a great way to make your time more efficient once there. If the laundromat isn’t busy, you can do all your loads at once (by using multiple machines); at a busier time, this might not be doable. Checking the setting on the machine, before you start your load, is always recommended. You never know what the person before you was washing and they may have had the machine on a setting that isn’t favourable for your clothes. Not only does bringing your own laundry detergent accelerate the process, it’s also a more economical option. By bringing your own detergent you can ensure you’re using the best detergent for your skin and avoid having to purchase detergent from the laundromat, which is more costly. Here at Washday, we are proud to offer a variety of high-quality laundry services, including a full-service wash and fold, for our customers. We’ll handle all your laundry needs, so you can spend your day however you’d like! This entry was posted in Blog on November 14, 2017 by admin. Dry cleaners offer a variety of services that help keep your wardrobe looking and smelling brand new. Here are some reasons why you should be taking your clothes to the dry cleaners. We all love nicely pressed clothes that are wrinkle-free; however, many people view the time spent on laundry as time that could be better spent elsewhere. 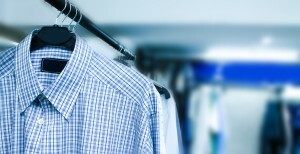 Utilizing dry cleaning allows you to just drop your clothes off and come back and get them later. Our lives are busy enough as it is, trying to balance work and family. Using a dry cleaning service gives you the peace-of-mind that your clothes will be handled professionally, while you go about your day. Dry cleaners are full-service clothing care specialists. In addition to keeping your clothes looking and smelling fresh, professional dry cleaners can sew on or repair loose buttons and perform alterations. So, if your favourite outfit doesn’t fit quite right, a dry cleaning service can administer alterations that will give you comfort and confidence in your outfit. Whether it’s removing tough stains or knowing how to best handle different fabrics (leather & suede, wedding dresses and formal wear, etc. ), dry cleaners have the knowledge and latest tools required to keep you looking fashionable and help you get the longest life out of your fabrics. For instance, dry cleaning removes grease and oils from wool fabrics. Placing wool clothing in the washing machine can cause the clothes to shrink and become distorted. Having a dry cleaning service handle more delicate fabrics, allows your clothes to get cleaned without damaging the fabric. At Washday we are proud to offer our customers laundry, alteration, dry cleaning and many more services, all under one roof, to make meeting your clothing needs as easy as possible. This entry was posted in Blog on September 19, 2017 by admin. What’s the Best Detergent for My Baby’s Skin? In their first 12 months, a baby’s skin is more susceptible to aggravation from chemicals found in laundry detergents, shampoos and soaps. So, how do we choose the best products to keep our little one’s clothes clean and comfortable? For all the soon-to-be parents out there, you might think getting gentle laundry detergent for your baby’s clothes is enough; however, every time you pick up your youngster, they are coming in contact with your clothes as well. So, even if your detergent is not causing you any discomfort, it may contain properties that will cause irritation to your child’s delicate skin. Opposed to having separate detergents for you and your baby, it is best to choose one safe laundry detergent and use it on everyone’s clothes. This enables you to cuddle with your little one without fear of any detergent residue irritating his or her skin. Liquid detergents tend to have milder chemical agents than powdered options. Also, look for detergents that list all of their ingredients. Avoid detergents containing optical whiteners, industrial enzymes or synthetic perfumes. These agents can get trapped in clothing and should they get wet can begin to irritate your child’s skin, causing rashes or irritation. Many detergents incorporate dozens of chemicals that leave your clothes with a pleasant, refreshing fragrance after going through the wash; however, these detergents can cause negative reactions when those agents come in contact with skin. When looking for the best detergent for your baby, look for labels that say fragrance-free as they are less likely to contain these chemicals that can cause irritation. In general, the more natural the laundry detergent is the less likely your baby is of having any negative reactions to it. This entry was posted in Blog on August 22, 2017 by admin. 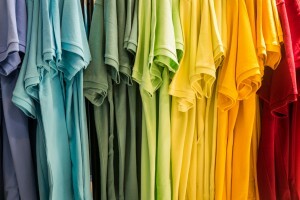 How Can I Keep My Clothes from Losing Their Colour? We all hate to see our favourite shirt or jeans slowly lose the vibrant colours that attracted us to them in the first place. Unfortunately, it’s during the washing cycle, when our clothes are being cleaned, that they begin to lose their colour. So, the next time you’re doing laundry, utilize these tips to preserve your favourite shirt’s colours. Turning your clothes inside out, prior to placing them in the washing machine, prevents brightly coloured clothes from direct exposure to hot water and detergent. Also, putting your clothes inside out prevents the surface of your clothes from getting caught on zippers or rubbing against other clothing. This stops your attire from getting pulls and fading. Warm water can cause the dye in clothes to fade faster – especially with darker colours. A short, colder cycle is best to preserve the fabric’s dye and fibers. It’s best to wash light coloured clothing with other light colours and darker clothing with other dark colours. Also, heavier clothing can wrinkle and potentially even tear lighter clothes in the wash. To avoid damaging clothes, separate your loads between heavy and lighter articles of clothing. 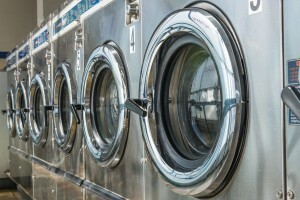 Unless your clothes have gotten seriously dirty or you participated in physical activity, clothes often don’t have to get washed after each use. For example, if you haven’t been sweating, jeans can be washed after every few wears. This cuts down on the amount of time they are washed and helps them retain their colour for a longer period of time. These four tips will help you get the most wear out of your clothes and keep them in optimal condition for as long as possible. This entry was posted in Blog on August 8, 2017 by admin. From sweat to dirt particles that become trapped in your clothes to food that happened to get on your favourite shirt, our clothes go through a lot on a daily basis. Here are some tips you can use to keep your preserve your clothes cleanliness for as long as possible! We all have our favourite shirt and pants but resist the urge to wear them over and over again! Rotating through different clothes prevents your garments from accumulating dirt and requiring a trip to the washing machine sooner than later. Fold heavy clothes, such as sweaters. 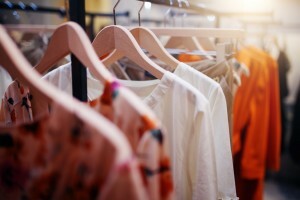 It may seem ideal to hang your favourite sweaters to prevent them from getting scrunched in a drawer; however, heavier clothing can become stretched out in a closet. This process can potentially be made worse when they are then put in the wash.
Cosmetics, such as makeup and lipstick, can cause stains and discolouration–should they get on your clothing. Your best option is to change first and then wear a robe over your outfit, as you apply your makeup. This allows you to keep your face looking great and your clothes cosmetic-free. Unless you have been in a situation that promotes sweating (i.e., rigorous physical activity or hot temperatures), consider hanging the article of clothing to allow fresh air to circulate through it. This technique is especially effective with jeans, which can be aired–opposed to being washed after every wear. Certain materials are more durable than others. 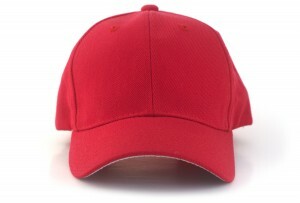 For example, the natural fibers in wool are more resistant to stains, odours and moisture than other options. Integrate these tips into your laundry cycle will help keep your clothes looking, smelling and feeling fresh for as long as possible. Should I be Using Fabric Softener with My Laundry? Fabric softener certainly isn’t a laundry must; however, the softer, fluffier feel that it provides has made this laundry product a staple in many washing machines. Without the use of a fabric softener, your clothes can be left with a scratchier, rougher feel to them. 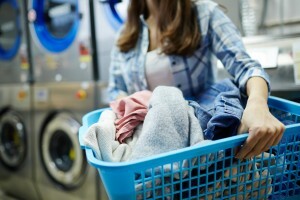 How Much Do You Know About Fabric Softeners? It’s important to remember that fabric softeners are made of chemicals that are then applied to your clothes, which comes in contact with your skin. If you notice that your skin is irritated after using a specific fabric softener, try a fragrance or dye-free version. It’s often the chemicals added to provide a colour and scent that causes skin irritation. In addition to adverse skin reactions, consider unwanted side-effects with your clothes. Studies have shown the chemicals found in fabric softeners can impede their ability to properly absorb water. This can create an issue with items like towels or cloth baby diapers, in which these items’ performance is compromised. Lower your washing machines spin speed. This reduces the chances of hard towels coming from the washing machine. Make your own fabric softener. Homemade fabric softener is a great way to avoid the unnatural ingredients found in store-bought products. Hypoallergenic dryer balls are another option to minimize static cling and soften clothes for when they come out of the dryer. At the end of the day, it’s your decision how you choose to wash your clothes but if you’ve been looking for a replacement for fabric softener, hopefully you have gained valuable insight on alternative clothes washing products. This entry was posted in Blog on July 11, 2017 by admin.